Students are mostly adept at using the exercises and answers, and they often refer to the textbook for formula sheets or equations. However, they are mostly unable to utilize the expository text in the book -- even the top students. Teachers who have successfully or unsuccessfully done this in their classes already: What was your approach to teaching students how to read their math textbook, and what happened? One thing you might do is contrast reading mathematics textbooks with reading novels. I have seen this done at the start of a textbook draft for a course on the Kuratowski closure operators (MESE sketch). I see that Topology was mentioned in a comment above; here are some notes I wrote up early on for students going through Munkres' text. Most of these questions come from just a couple of pages in the text (pp. 76-77) and my goal was to emphasize early on that reading a book like this passively would not suffice. I did not have a control group, but several students did make an honest attempt at answering these questions, which I expect was helpful to them. Probably it would have been better if I had continued to ask questions like these (or had the students formulate their own questions in a similar vein). For reading individual proofs, my colleagues and I have had some success in research studies with self-explanation training adapted for mathematics students. We haven't extended this work to whole sections of books yet, but it was encouraging to find that students could improve their reading after light-touch training - they did better in subsequent proof comprehension tests, and they showed reading behaviours more like those of professional mathematicians (as measured using eye-movement data). The research paper is at http://www.jstor.org/stable/10.5951/jresematheduc.45.1.0062. and see that English text still makes sense if you scramble it up. I then have them putting in a section from a math textbook, and see how it doesn't make sense, particularly with the many different types of data in a textbook - words, numbers, symbols, tables. I explain to them that a very different kind of reading is needed with mathematics. This isn't just about reading formulas or reading text. Linda Takami, in her dissertation, observed: "“In mathematics, it is necessary to read from left to right, right to left, top to bottom, bottom to top, and diagonally. In addition, tables, graphs, charts, symbols, and illustrations are a part of mathematics reading and are critical to comprehension of mathematics concepts ” (2009, p. x). These tables, graphs, and charts are often presented in a different spot than the text that refers to them, and so students encounter them and then just skip over them. Takami suggests that a teacher might say something like: “you’re going to be asked to write an equation from the data on these graphs” in order to help create a purpose for reading. (If you have proquest dissertations at your school, you can find the full dissertation here: http://search.proquest.com/docview/305018920). When I taught Algebra 2, I generally had to scaffold the reading of the text - walk students through it the first few times, and gradually get them to the point where they could read it on their own. 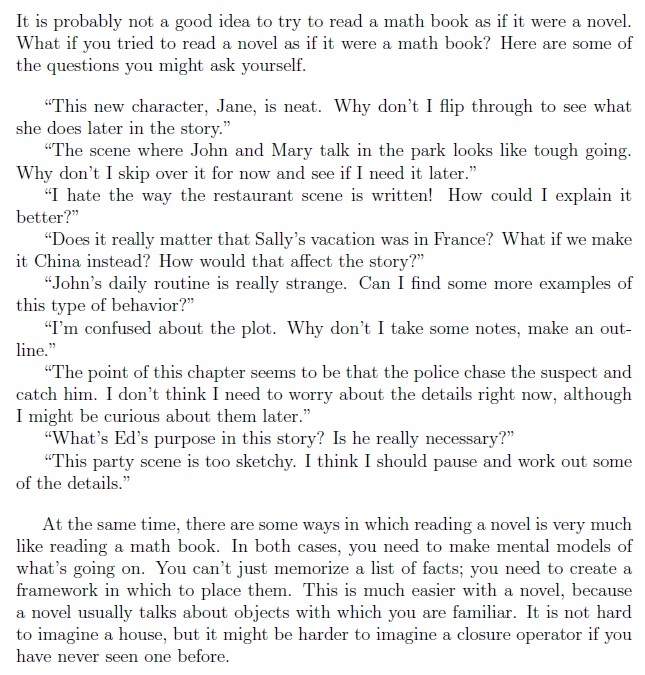 Roni Jo Draper ( http://www.ed.sc.edu/raisse/pdf/MathArticles/SchoolMathematicsReform,Constructivism,andLiteracy.pdf ) had similar ideas about having a purpose for reading. She says that students should have a purpose for reading - some question they'd like to answer, some problem they've been unable to solve. Then they can read the section of the textbook looking for that answer. Much like an English class, students should also stop and summarize and make predictions as they read a math text. Again, I found that I had to explicitly teach these skills, rather than just talk to the students about them, and gradually get it to the point where they could do this on their own. Reading intellectually challenging material simply requires practice, so all you can really do to help your students learn this skill is to force them to practice. Many students have an immature approach to education, and therefore tend to do only what we give them direct incentives for doing. I give incentives such as easy, multiple-choice reading quizzes that happen during the first 5 minutes of every class. Without such an incentive, I'm sure most students would never attempt read the book. They also will take their cues from your behavior. If your classes consist of nothing but straight lecturing in which the material is presented from scratch, then they will see that you didn't expect them to read. I use lecture for active learning and for working on concepts that I know are hard for everyone -- not for spoon-feeding them simple facts and definitions of terms that they were responsible for getting from the reading. These techniques work well for me, and nearly all my students do the reading. They're not original ideas of mine. You can find them described in by Eric Mazur's book Peer Instruction: A User's Manual. I had tried a few different strategies in high school with little success. My first attempt was having the students read the textbook and take notes on what they read in a very prescribed way. At the beginning of the class I explained that this was an attempt to teach them how to read a math textbook, and how that was different than any other kind of book. I would give them an open note quiz before we started a section. It was helpful for some students, but for the most part it was a way to reward good students and punish poor students. Overall I decided it was unhelpful at teaching the students who needed the help most of all. I tried something like a flipped classroom for some lessons. I would assign reading and videos for homework (after I had determined that the whole class could access the videos), and then the next day I would develop the skills beyond what they had learned on their own. This was a disaster, far too many students didn't do the reading, or watch the videos. Which left a handful of students actually prepared, but the majority of class unprepared for the more advanced topics. I still think this could be successful, but it would require more commitment from the teacher, and buy in from the parents. Also age and habits are difficult to get a handle on, older kids can better accept the responsibility, but are more ingrained with the habits of a traditional classroom. The most recent effort I had was to increase the amount of writing. I assigned traditional homework, and provided solutions for all of the homework problems, but what I checked for credit was a card with three questions. One question would be one of the homework problems, I never revealed what this would be in advance. The last two questions would be more thought provoking: "Describe the differences between ellipses and hyperbolas" or "When might a polynomial have no real solutions?" Sometimes I would give them the writing questions the day before, and sometimes I would give the questions at the beginning of class and allow a few minutes to write. Some of the questions would reference their notes or the textbook. I would accept almost anything for credit except "I don't know," if a student didn't know the answer I tried to get them to tell me what they thought might be the answer and why they weren't sure. I read all the cards and used that to help drive the lessons for the following days. This was the most effective method I tried to increase reading, but it was the most work on my part and only had an incidental effect on reading. Give (modest) extra credit for reading the text critically (very useful to fix your own lecture notes). Give homework on the lines of "give an alternative proof" or make them invent and work through some examples. It might be useful to collect wrong proofs (where the conclusion is right and where it is wrong) to exercise finding (and patching) holes, and finding counterexamples. I do something at least mildly annoying: I make 10% of their class grade be showing up each week with the examples from the sections of the book we will cover that week written out by hand. That is, if in week 3 I will be covering sections 4.1, 4.2, and 4.3, then at the beginning of class that week they show up with a stack of paper on which they have copied all the examples in the text from sections 4.1, 4.2, and 4.3 by hand. It's a lot of work, but not an undoable amount for most textbooks, and for most students it's the first time they actually read the text. I get lots of positive feedback about this, despite how tedious it sounds. Xerox a couple of pages of exposition from the textbook ahead of time. Give a five-minute-max lecture-type introduction that motivates the hand-out. Now distribute the hand-out. (Don't tell them at this point that it's from their textbook.) Let the students know that if they have any questions, they can raise their hands and you'll come and help. When someone raises his hand, go to his seat and squat down next to him. Carry on a soft, short conversation with him. You'll probably be able to get him unstuck quickly, or be able to tell him that he asked a good question, which will become clearer a couple of paragraphs later. If it's a large group, bring some TAs to the class to circulate with you. If it's a large lecture hall, ask the students to leave every other row in the hall unoccupied. You need to be able to move among the students comfortably. After some reading time, you can re-teach the material if need be; maybe you'll be able to elicit a fair amount of the material from the students. Don't hesitate to have students put things on the board. Just don't put anyone on the spot, with just one student coming up to the board all by his lonesome. Draw vertical lines to make sections of board, so that each student has his own section of board. Let them explain their sketches or equations by turns if they want to -- this has to be optional for shy students. Don't do this every session, but do try it at least once every two weeks. By the way, also take some time at least once every two weeks in the early part of the semester to have students work collaboratively in small groups during class. This will facilitate the formation of study groups that meet outside class. Students need to learn to talk about math with each other, and show each other math. Students get spoiled. For many students, it's much easier to learn something from you than from the book. Difficult things get easier with practice. If reading the text is a bit scary ("What if I don't understand anything, and it's all gobbledygook? "), then have them do it the first few times in a safe environment, with you (and the TAs, perhaps) there as a safety net. Different students learn best in different ways (auditory, visual, exploratory, etc.). So, it is important to present the material in a variety of ways. I have been making mathematical reading skills a large part of my abstract algebra class this semester. A full 20 percent of their grade comes from writing reflections on the reading the text. I gave them a handout in which I analyze a small piece of mathematical writing. I gave them the definition of "injective", and the theorem that the composite of two injective functions is again injective. Then I give different categories of things they should do, together with examples. For instance, they should look for examples/nonexamples of the definition. They should try to rephrase the definition into a logically equivalent form. They should form connections to other definitions they have seen, etc. I have the students do "self explanations" of the proofs they read following Lara Alcock's paper mentioned above. The students have to write a few pages once a week on their reading, and class time is primarily spent resolving questions which have arisen during their reading. A lot of the resolution comes from other students. Another 20% of their grade comes from writing proofs of a few theorems each week, and they spend some class time exchanging papers and critiquing each others work. It is going extremely well so far. The engagement with the material is at a much deeper level that in previous semesters. I will update later in the semester. Here is what I gave out as an extra credit assignment to students who were interested in how to get more out of their textbook. Students mostly got the last problem correct, so the results were that the people who did this voluntarily really got something out of it. The handout was 5 pages long. How many pages of the book have we made it through? How many pages of our own math writing did it take to make it this far? When you have to read a math book in the future, what is an important tool you will absolutely need in order to do so successfully? I copy-pasted the activity below although it is out of a google document instead of being properly TeX'd, so you probably won't be able to use it as is (for example, the integral signs didn't make it, nor the exponents or fractions). Still, it's here if you're interested. The purpose of this exercise is to help you think about how to read a math book. Reading a math book is much different from reading other books! Find the derivative of 13(x2 + 1)3 + C. Why is this answer relevant to example 1? Find the derivative of sin 5x + C. Why is this answer relevant to example 2? Step 4. Look at the “Exploration” box at the bottom of the page, after Examples 1 and 2. 4. Complete questions a through e on this page. d. (multiply by ½ and also by 2, as your first step). e. (multiply by __ and also by _ as your first step). Step 5. Read Example 3. What does this have to do with the things you did in parts d and e on the previous page? Use this wrong method (factor everything out of the integral) to find x2 dx. What is the actual correct answer for x2 dx? It says in here that if u = g(x), then du = g’(x) dx. That last equation looks weird. What happens if you divide both sides of it by dx? Does that make more sense? If u = x2, what is du? Following the examples, solve x3x - 1 dx. Check your answer to see if it is right (how do we even do that)? Step 9. Read Example 6. It is getting crazy now. Remember that sin2 x means (sin x)2, and sin3 x means (sin x)3. Check their answer by taking the derivative. Step 10. How to read a math book. 11a. How many pages of the book have we made it through? A friend of mine who taught college math used to give pop quizzes at the beginning of his topology class on the material which was assigned to have been read for that day's class. The questions were of a type that if a person had made a decent effort to read the material he/she could do well on the quizzes. Not sure if I would recommend doing this, but he claimed it worked well for him. Several years ago, I succeeded in having one of my classes linked with an English reading class in the hope that the reading material in the English reading class would be the text in the mathematics class (which I had writtem) so that the English instructor would be "on the side of the students" and could provide feedback on the text, at least from the readability viewpoint. While, curiously enough, the English instructor felt compelled to sit in on the mathematics class---which however she seemed to enjoy very much to the point that she would often ask questions in class, she did not use the mathematics text as reading material in her English reading class. Even though the Instructor publicly wrote later that she regretted not having used the mathematics text as reading material, I was never able to have another one of my classes linked with an English reading class. Phase 1. Students scour the new chapter, extract key information and write it in their notebooks. In our textbook series, key information is conveniently presented in blue boxes. They don’t need to understand it yet so this is low cognitive load work. But knowledge is slowly starting to go in anyway. This activity distills the great unknownness of the chapter into a small unknownness which can serve as the reference point for reading the expository parts later. It’s easy to push students along here. But a boring way to start a Unit. I generally throw in a few schemata-supporting activities and games first. And at least one good challenging question (ye olde opening problem) which the students can at least understand the question. Phase 2. Consider, reflect, discuss the material from Phase 1 as a class. Be careful not to get caught up correcting and teaching here. The stuff distilled from the textbook needs to become shared knowledge. Phase 3. Examples and exercises. Mathematics is learned best by just doing it. So, students look at the next problem. If they can do it, they do it. If they can’t do it, they refer first to their notes from phase 1. If that helps, they move on. If it doesn’t, they know where to go hunting in the section/chapter for more details (because at least they remember what page they copied that stuff from). Provided you have given students a list of exercises to complete, they can get started and work at their own pace. Our textbook series has too many questions, so I publish a minimum list at the start of the year/Unit. Phase 4. Step back from the exercises and discuss what we can now do. What have we learned? Skills, concepts, facts. This is where we focus on the processes and concepts. And we start to consider how they could be used in other contexts. Phase 5. Explorations, investigations, challenging problems. If there is still time left in the Unit (it depends on the students) we spend time tackling bigger things and learning how to communicate using our new mathematical language and skills. The textbook sometimes has bits for this but often I have to draw on other resources. That’s basically how I approach using a textbook well and making sure students get the most benefit out of the expensive books they’ve purchased (although my current school loans them to students from the library). Plus, I don’t enjoy reinventing the wheel. We have good books so I want to use them as best we can. The exercises and answers ARE the most important part of the book. Math is a practical, almost physical, art. You learn by doing. The value of the exposition comes mostly in use to help with doing the problems. The only case, where it makes sense for the students to properly work through the exposition is if they are pre-reading the material before lecture. I am highly supportive of that. But if they aren't, it's not that important to read it afterwards. Better to dive into the problems. 2.5. If you want to encourage pre-reading consider to do very simple one question quizzes on the reading assignment. 5 minutes at beginning of class and have the students exchange papers to grade them. The idea is to promote the drill, but do so at minimum complication factor. The reference material is the least important aspect. (Least means lowest of the three, not zero.) This is because even for review, the best method is to work problems. For those students who use the technique of preparing for exams by writing a formula sheet (not for use during the exam but for prep), than the reference aspect has some limited value. But this only serves a TINY fraction of students who are already mastering the given text (and this question has as predicate that we know that doesn't happen enough) and want more deep info. For the vast amount of students, it confuses them rather than helps them to have the twin perspectives along with the invariable differences in notation and the like. And I understand where the students are coming from then, when they say screw the book and just follow lecture notes. Simple hint: Do a few practice problems right out of the book in class. Simpler hint: Pick a user friendly book with all the answers and very simple exposition. There are WAY too many professors who write books based on comments from other professors rather than to help the students. Not the answer you're looking for? Browse other questions tagged undergraduate-education secondary-education general-pedagogy transferrable-skills or ask your own question. How to help student get to grips with exercises, definitions, theorems? How can we help students learn to write about their mathematics? How can we help students learn to effectively take notes? How does CalcChat work, and how can students who use it be encouraged to do so constructively? How can I choose a free calculus textbook? Do iPhones help students in their math class? How can I help an eighth grader learn to write mathematically?